In October of 2008, the University of Central Florida and Children’s Home Society of Florida agreed to explore ways to partner together to improve outcomes for children and families. By January of 2009, they were committed to work together to bring a “community school” model developed by New York Children’s Aid Society to Orlando. Community schools led by the Children’s Aid Society in New York have transformed their neighborhoods — the community schools are recognized as safe places, even in the most dangerous areas — and have significantly enhanced the quality of life for students, their families and community members. 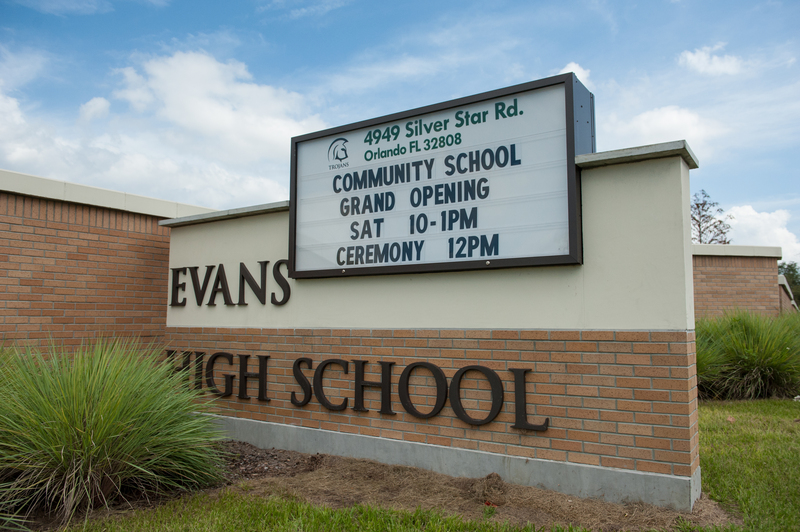 “Evans Community School” opened in August 2012 to offer student-centered, family-focused and school-based wraparound services to Evans High students, their families and community members in the surrounding impoverished Pine Hills neighborhood. At the time, Evans was one of two high schools identified as persistently low performing within Orange County Public Schools, the 10th largest school district in the nation and the fourth largest in Florida. Eighty-four percent of the 2,424 Evans’ students in grades 9-12 were eligible for free or reduced lunch. The unemployment rate in Pine Hills was approximately 10.5 percent, exceeding local, state and national averages. Today, the Evans campus is open days and evenings year-round, providing a safe, familiar environment where students can get help with homework, improve their reading skills and overcome other learning obstacles. Additionally, parents, families and others in the community have access to adult learning programs. The Evans campus also provides students and their families the opportunity to experience new social and cultural activities, and have access to medical and wellness programs. Since the community school idea began in 2008, graduation rates have risen from 67 percent to 88 percent and average SAT scores have improved by over 20 points in writing, math and reading. More than a community center, the Evans campus is becoming the hub of the community. The comprehensive approach at Evans High School • A Community Partnership School is led by core partners Children’s Home Society of Florida, Orange County Public Schools and the University of Central Florida; additionally, many other health, cultural and social service organizations are involved to integrate programs, activities and services into the education and lives of Evans High School students and their families.